So, Happy St. Patrick’s Day from Kegel8! That’s right; it’s that time again! So, have your shamrocks at the ready and prepare to join in the ‘green’ festivities, because St. Patrick’s Day is upon us. Originally associated with the colour blue, St Patrick’s Day has been celebrated by wearing green shamrocks and ribbons as far back as the 17th century. It’s all about fun, and even for those not keen on heading to their local for the night, a quiet half/pint of Guinness or a celebratory Irish coffee just may be on the cards. 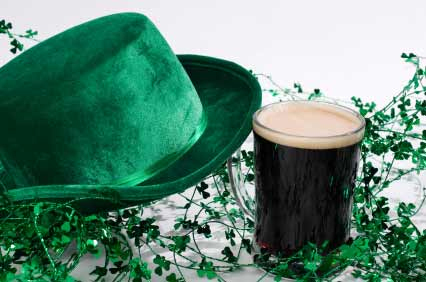 Although, seemingly a day dedicated to drinking alcohol, St. Patrick’s Day is actually devoted to commemorating the life of St. Patrick, the most widely recognised patron saint of Ireland. In addition, it is a time to pay homage to the country’s rich heritage and culture, and celebrate the introduction of Christianity to Ireland. Before the festivities really begin, the day, for many, still involves spiritual renewal and prayers for missionaries around the world. St. Patrick’s Day is observed annually on 17 March as this is the date he died, according to one of several theories. The Irish are well renowned for their love of travel. In fact there is an Irish diaspora (Irish emigrants and descendents living in other countries) of over 100 million people globally. This is more than 15 times the population of Ireland itself. So, it’s fair to say that there’ll be many people, the world over, enjoying a little tipple at some point today. Although drinking in moderation is considered harmless, there are some effects on our bodies which we are perhaps not conscious of. We all know that there are many dangers associated with drinking to excess, but did you know that drinking alcohol can actually weaken your pelvic floor, in many cases resulting in incontinence or other debilitating pelvic floor disorders? Alcohol is a diuretic, and as such it speeds up our urinary output. It is true that the more we drink, the worse it gets. However, just one alcoholic drink will increase the frequency at which we urinate. Over time, this could be a contributory factor for developing incontinence. Always have a glass of water in between alcoholic drinks, as this dilutes the alcohol in the bladder, reducing both irritation and urinary concentration. This effectively limits the chance of irritation during urination itself. Although it may seem counter-productive to drink a greater volume of liquid, the more diluted the urine is, the lower the risk of irritation. Additionally, as we are unable to contract the muscles in our pelvic floor efficiently after a couple of drinks, a general lack of strength within the pelvic floor can occur. Don’t worry; it’s not all bad news! Luckily Kegel8 can help with your pelvic floor; leaving you to concentrate on that miracle hangover cure, rather than worrying about your future continence. Each of our Kegel8 pelvic toners is designed to rebuild the muscle strength and tone that has been lost throughout years of enjoying the odd drink. It will also help to prevent future pelvic floor disorders. That’s what we like to call a ‘pot of gold’! So, now there’s no need to feel guilty when you want to raise a glass or two to St. Paddy.